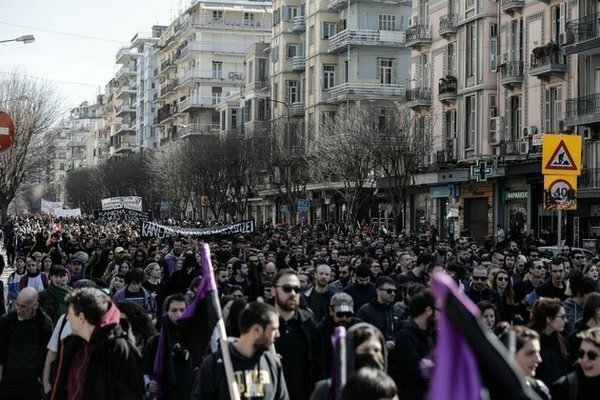 On the 10th of March 2018, we participated in a mass demonstration in the city of Salonika, responding to a call across Greece and the Balkans. On this day thousands of people came together on the streets with a common stance against fascism and nationalism. Every block in the demonstration lent a different focus to the manifestation. Some blocks expressed primarily their solidarity to Libertatia, the squat that was burned down by fascists during the recent nationalistic manifestations over the naming of a neighboring country. Others stressed nationalism and patriotism as foundations of the greek society. Others stressed patriarchy as a structural element of the nation-state. There was also internationalist presence from the Balkans. This mass demo was well and strongly guarded against possible police or fascist attacks. A big part of this gathering understood that the struggle against fascism is one and the same with the struggle against the state. In this spirit a big crowd from the demonstration proceeded to attack the military forces of repression. We co-organized this attack, which was carried out after the end of the demonstration, accepting in this way the characteristics that had been decided that no clashes occur during the march. 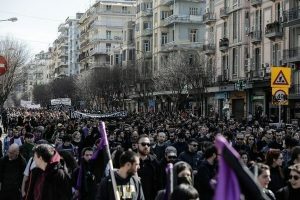 The insurgent crowd was multinational; men and women from all over Greece, the Balkans and the Middle East, showing in deed that proletarians have no homeland, fought the cops with fire, stones and all available means until the cops retreated. The battle against the repressive forces of the state is and must be a popular field of struggle open to all the oppressed. This openness together with the continuous conflict with the armed guards of the regime is giving the perspective for a revolutionary movement. Later on the same night, dozens of comrades attacked with molotovs, simultaneously from two sides, the police forces that guard the turkish consulate in Salonika. We are well aware that our main direct enemy is the greek nation-state. But the struggle for social liberation is global. By attacking the structures of the turkish state we send our solidarity to those fighting fascism and statism in Turkey and Central Middle East. Within the territory of Turkey we are witnessing brutal repression from the fascist regime with mass imprisonment, executions and genocide against ethnic groups. Beyond its borders, turkey is a major actor in the ongoing war in the Middle East. In this region is unfolding a social-political revolution with anti-state, anti-patriarchal and multinational characteristics. The center of this battle now is in Afrin, where the fascist state of Turkey is unleashing its full force of artillery against the communities in resistance, against those who fight for freedom and autonomy. The victory of this revolution is paramount for the prospect of social liberation. From our side, one of the collective subjects that carried out this attack, we dedicate this day and our actions to the fallen comrade Haukur Hilmarsson (Heval Sahin Hosseini) who sacrificed himself in the defense of Afrin and of the revolution. We dedicate this day also to Lambros Fountas, member of Revolutionary Struggle, who was killed by the cops during an action on the 10th of March 2010.